"Alfred Hitchcock's Psycho: A Casebook" collects some of the finest essays on this groundbreaking film — a film that is ideal for teaching the language of cinema and the ways in which strong filmmakers can break Hollywood conventions. Psycho is a film that can be used to present the structures of composition and cutting, narrative and genre building, and point of view. The film is also a highpoint of the horror genre and an instigator of all the slasher films to come in its wake. The essays in the casebook cover all of these elements and more. They also serve another purpose: presented chronologically, they represent the changes in the methodologies of film criticism, from the first journalist reviews and early auteurist approaches, through current psychoanalytic and gender criticism. Other selections include an analysis of Bernard Hermann's score and its close relationship to Hitchcock's visual construction; the famous Hitchcock interview by François Truffaut; and an essay by Robert Kolker that, through the use of stills taken directly from the film, closely reads its extraordinary cinematic structure. Contributors include Robert Kolker, Stephen Rebello, Bosley Crowther, Jean Douchet, Robin Wood, Raymond Durgnat, Royal S. Brown, George Toles, Robert Samuels, and Linda Williams. 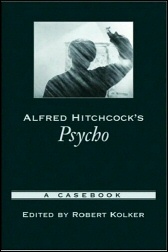 Hitchcock Annual (2004) - Book Reviews: "Alfred Hitchcock's 'Psycho': A Casebook"